Our Hori celebration in DC area is over, but the memories will last forever. Every year it's becoming better and better. This year the pleasant spring weather added a special charm. About 60 families with representatives from 8 states, Michigan, Masachusetts, New York, New Jersey, Pennsylvania, Delaware, Virginia and Maryland participated in the event. Although the program started late as our Jagannath temple priests couldn't reach on time, that didn't affect our mood. We all adapted ourselves and enjoyed. A community event needs each and everyone's cooperation to be timely and effective. Although we couldn't become timely, but everybody's cooperation made the program enjoyable and effective. The kirtan dancing during the Hori procesion, the Arati and classic Odia bhajans, our talented performers of the shows, our highly motivated volunteers for the audio system and stage management, our young and vibrant MC, and our dedicated volunteers who coordinated, cooked and distributed food, all of them added charm to our function. Many friends met each other after a long interval, many children had grown up, and were looking different, many singles were married and they joined with their spouses, and it was such a great pleasure to see them talk, laugh, put abira on each other, interact and enjoy. What is life anyway? It's about communication, feelings and interaction. It doesn't matter whether the interaction is frequent or infrequent, but it matters whether it adds a special charm or causes unnecessary tension. We thank you all who volunteered, who drove long distance to participate in the function, who worked hard to perform and present a cultural item, and whose presence and smile added special charm to our function and to our memory. Another great fact was the greatness of the temple people. It's becasue of their help and friendly attitude that we celebrated Holi in this temple for the second year in a row and we wish to continue our Holi function every year in the same location. Although our function went beyond time, they were very coopeartive and nice. We felt the brighter side of the human nature, and that is caring, considerate and noble nature. Most of the credits go to Anshuman Das and Lalit Behera for the stage decoration. The decoration items were prepared by Illa and Arun Ojha, and Naresh Das. 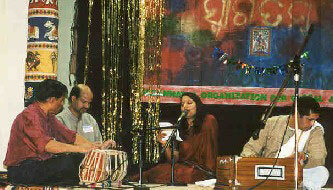 The bimana's entered the auditorium with kirtan and playing of color. The crowd was cheerful. The Kirtan Dance continued for about half an hour until the temple priests arrived. Naresh Das, Rasananda Behera, Pratap Dash, Indu Mishra, Nrusingha Mishra, Ajaya Mohanty, Padmanabha Pradhan and others entertained the audience with their devotional Kirtan dance. The deities were carried by Anshuman Das of New York and Sumant Misra of New Jersey. After all the bimana's reached the auditorium stage, Kanan Mishra, Bandita Mishra, Kalpana Panigrahi and Bijoylaxmi Dash did the "Arati". Temple priests Mahashakti Dasa and Nrusigha Chaitanya Dasa sang Arati songs while everybody in the audience were invited by Kanan Mishra and Bandita Mishra to do the "bandApanA". Kanan Mishra had taken charge of the Arati and she invited everybody with personal affection to do the "Bandapana". Bikash Mishra and Sharmistha Mohapatra were at the registration desk distributing the program schedule, name tags and the bhajan patrika. They were also selling T-shirts. The T-shirt with JOGA loga was the idea of Brahmapriya Sen. His intention was to have Ranga-kheLa with an uniform identification. Kalpana Panigrahi delivered the welcome speech. She welcomed everybody on behalf of Jagannath Organization for Global awareness, also known as JOGA. In her speech she told that, JOGA, the meaning of which is addition can be used for many things. But the one which is very significant for spiritual world is bringing together human soul with supreme soul. There could not be better celebration than Holi for this Joga purpose. She told that for our Holi function Supreme Lord was with all of us in his beautiful biman to play in the festival of color. She thanked the families for bringing Bimanas and participating in the function. After her welcome speech, Kalpana Panigrahi invited Asha Sahu, Deepa Parija, Meera Mohapatra and Bigyani Das to sing the Welcome Song. Mahashakti Das accompanied them in Harmonium and Surendra Ray in Tabla. The song "Aji Asichhi Asichhi Hori" welcomed the audience to enjoy life as much as possible since every moment of life is precious. After the welcome song, she invited Nrusingha Chaitanya Dasa of Baltimore ISKCON temple to coordinate the Bhajan program. Bhajan Program was moderated by Nrusingha Chaitanya Prabhuji. He gave many touchy introductions about Lord Krishna's different acts. His descriptions took the people to Gopapura and some of us felt as if we are visualizing Lord Krishna's Ranga-Khela in Gopapura. Bhajan started with Mahashakti Dasa. The bhajan was "kinAdare prANasangini subhuchhi kadamba-bane" by Jayadeva. After that Deepa Parija sang the bhajan "duti kahibu go, prANabandhunku etiki". Mahashakti Dasa then sang the Hori Bhajan "Brundabane Aji Asichhi Hori go prANamitaNI". The last song was again Poet Jayadeba's "Rati-sukha sAre" which was presented by Mahashakti Dasa. The songs were presented with the help of Surendra Ray and Mahashakti Dasa on Tabla and Harmonium, and by Naresh Das on singles (jhAnja). After the songs, Kalpana thanked Nrusingha Chaitanyaji and welcomed Hosensu Sahoo to introduce MC Smriti Nayak. The stage management, lights and sounds were taken care of by Brahmapriya Sen, Sanjaya Sahoo and Padmanabha Pradhan. Sanjaya managed the audio system with excellence and care. Brahmapriya Sen and Padmanabha Pradhan not only managed the stage, but were instrumental in other types of managements such as controlling the children. While introducing the MC Smriti Nayak, Hosensu also welcomed the newly married couples, Bikash and Dipti Misra, Debi and Lipi Singh, and Anup and Smriti Nayak. Smriti, the Masters of Ceremony for the cultural program first invited Hemant Biswal to pledge for the Educational Program carried out by JOGA. Hemant Biswal talked about the Teacher's Refresher Course organized by JOGA in Orissa and he invited others to join in this effort and contribute towards the improvement of Educational System in Orissa. Then MC Smriti Nayak started the program. 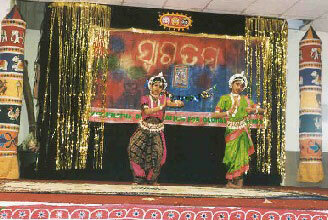 The first item was the Odissi Dance presented by Mrunali Das and Shriya Chhotray. Mrunali and Shriya both learn Odissi under the guidance of Dr Chitra krishnamurty, the director of Odissi dance school Nrityalaya. They presented the dance "Mangalacharan" with the prayer to Lord Jagannatha and Lord Ganesha. The second item was presented by Sikha Mishra. Sikha is a student at Johns Hopkins and she performed a Thillana. She took Bharatnatyam lessons for 4 years under the guidance of Sudha Chandrasekhar. Her parents Raj and Sandhya Mishra live in Michigan. The dance was a traditional piece that is one of the requirements for the arangetram, the graduation degree in dance. The song was in Tamil, with a small part in hindi. The third item, a Kathak Dance was presented by Srotalina Nayak. Srotalina has learnt that item from Tina Sharma of India School, Bethesda. The fourth item, a devotional dance was presented by Asmi Panigrahi. Asmi learns dance from Shila Rajasekhar of Ellicot City. This item she has learnt from Revati Kumar, her previous teacher. The fifth item "Muzra" was presented by Minu Pradhan. A 15 minutes dance was created by plugging in many Hindi Film songs including Umrao Jaan's famous gahzals "bas ekbAr merA kahAn mAn liziye". The sixth item was a Sambalpuri dance presented by Prerana Pradhan. Prerana learns Bharatnatyam. But this dance she has learnt herself watching a Sambalpuri Dance Video. 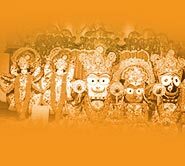 This drama was the shortest version of the 40 minutes Gitinatya "Babrubahana", the audio cassette of which was made with well celebrated singers and actors in Orissa. Babrubahana was the son of Ullupi and Arjuna. During their stay in Forest Arjun had married the sisters Ullupi and Chitrangada of Manipur. After giving birth to Babrubahana Ullupi had died and Chitrangada had brought up Babrubahana. After Mahabharat war Pandavas were making the holy ceremony of horse sacrifice and that horse was passing by different kingdoms. Arjuna was with the horse. If anybody imprisons the horse, he has to fight with Arjuna and win to claim victory. Babrubahana had imprisioned the horse. He didn't know that Arjuna was his father. The minister tried to explain Babrubahana not to make Arjuna his enemy, but he didn't listen. Babrubahana and Arjuna met at the battle field and Babrubahana killed Arjuna. With Chitranganda's devotion and prayer Lord Krishna arrived and gave back life to Arjuna. 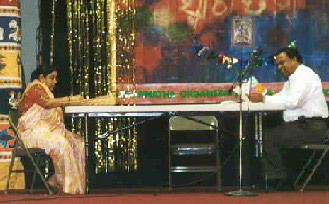 The performers were Satish Mishra (Arjuna), Siddharth Mahapatra (Babrubahana), Bagmi Das (Chitranganda), Rajashree Mishra (Mantri), Suman Ojha (Lord Krishna) and Shashwati Das (Bidusaka). The children did excellent job showing their understanding far above their age level. They had only two practices to perform in the drama. Thanks to the parents for their encouragement and hard work. This drama was very significant which relays the message that when a son achieves more than a father, it's a father's credit. Evenif the son defeats the father, it's not a defeat, but victory. The costumes for the drama were very luxurious and the children enjoyed their costumes. They were purchased from Krishna Chitralaya, Cuttack, Orissa. If you have watched the drama, then you could have probably noticed the talents within all these children. All the children have many talents that stay hidden and they just need a medium to express it. It's our duty to provide them the medium. Alok Mohanty from Philadelphia played the Clarinet. Ayesha Kar from New Jersey sang "Jana Gana Mana Adhinayaka Jaya He". Prerana Pradha played a Hindi Song in the violin. We missed Swati Mishra and Suraj Mishra's performance as they were feeling tired after spending the whole day in their school for activities and then reaching a little late to the Hori program. 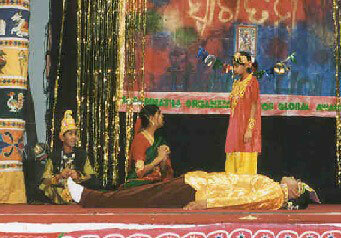 The adult drama "sunA hariNi" presented the life and aspirations of a middle class family of Cuttack, Orissa. The husband, Alekh, wants to adopt the modern lifestyle and make the children modern. The wife, Sikha, wants to uphold the best traditional culture. Alekh has a brother who stays in America. The drama presented their life and complexities and was performed by Nrusingha Mishra as Alekha, Bigyani Das as Sikha, Meera Mohapatra as Nanda, Dipa Parija as Rekha, and Bagmi Das, Mrunali Das and Shashati Das as Tuni, Muni, Kuni, Alekha and Sikha's children. The dance item of the drama "Ohre Kancha, Kanchki Gudiya" was performed by Bagmi Das. A Hindi Song from Love Story was presented by Dipti Mishra. Arun Ojha gave final thanks and announced the formal end of the Hori function. 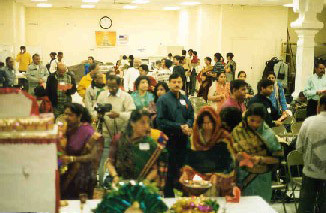 The major part of the program, food, was managed by Indu Mishra. 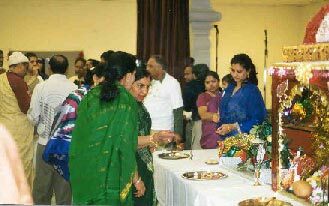 Mahashakti Dasa and his wife cooked the prasad for the function. The other people who contributed cooked items from home are Bandita Mishra, Naresh Das, Meera Mohapatra,and Pratap Dash. Sikha Sen, Bandita Mishra, Bijoylaxmi Dash and Kanan Mishra perfectly managed the food distribution. Arun Ojha has made video recordings of bhajan, drama, and the ending. Many people have taken photographs which will be available very soon. Also Amit Nayak and Anshuman Das have made some video recordings. Author: This report is prepared by Dr Bigyani Das.